Summaga is a relaxed all-day café, restaurant, and shop that offers and authentic taste of Ajloun. The menu is based on local ingredients produced by the farms, homemade dairy products, preserves, honey, herbs, spices and traditionally foraged greens presented through simple, traditional dishes typical to the area. Menu items are prepared and assembled on the spot and served with warm Jordanian hospitality. The space was recently revamped based on an ‘upcycle and re-use’ theme. The cooperative’s products are also on display for sale within the same space. serves breakfast, lunch and dinner menus and signature dishes using organic and free-range ingredients produced by Al-Kifah cooperative farms, including organic olive oil, apple cider vinegar, honey, zaatar, sumac, free range eggs and dibbes (molasses). A café featuring food from a woman-led farmer’s cooperative. The food is 100% organic and highlights local Ajlouni cuisine. Summaga café offers a nice, hot herbal tea before exploring the nearby castle or a full meal before embarking on the Jordan Trail.  The restaurant is the main outlet channeling the produce of the 25 organic farms within the villages of Ajloun. It contributes to the direct sale of products in addition to showcasing recipes and unique dishes that can be made with them. Moreover, Summaga created an opportunity for Ajlouni women to work on a full-time basis and be part of the tourism workforce. Summaga also contributes to job opportunities created on the farms themselves. 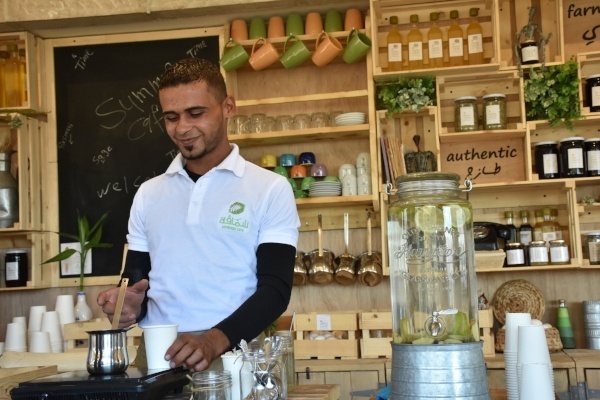 Umaima Al Momani began working at what is now Summaga Café in Ajloun in February 2015. She was offered the opportunity through a contact of hers, Nusaiba Al Momani, who was head of the Kifah Cooperative. 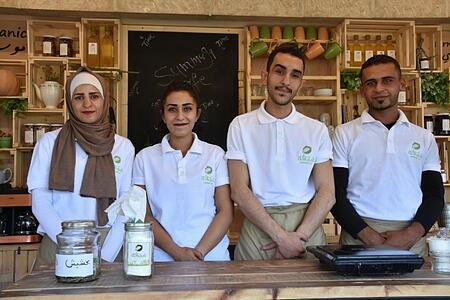 “Nusaiba called me and said she’s got approval from the Ministry of Tourism and Antiquities to manage a restaurant at the Ajloun Visitor Center. When she established the restaurant she chose me as most suitable for the position from among several others, and asked me to join her and be its first employee,” recalled Umaima. At the time Umaima was 21 and studying accounting at a college in Amman and was commuting there daily from Ajloun. She took on the fulltime job and continued pursuing her diploma; she would go straight to the restaurant after her college classes and work until 9pm.